L.L.Bean knows the only way to promote the launch of its Small Batch Bean Boots is with craft beer. Yes, you read that right: craft beer. According to Food & Wine, the iconic outerwear and sporting goods company is teaming up with Fogtown Brewing Company, Mast Landing Brewing Company, Orono Brewing Company, Rising Tide Brewing Company and Threshers Brewing Co. — all of which are from L.L.Bean’s home state, Maine. “Introducing #BeanBootsandBrews, a collaboration between L.L.Bean and Maine craft breweries!” L.L.Bean wrote in an Instagram caption, which served as the official announcement for the venture, on Friday. 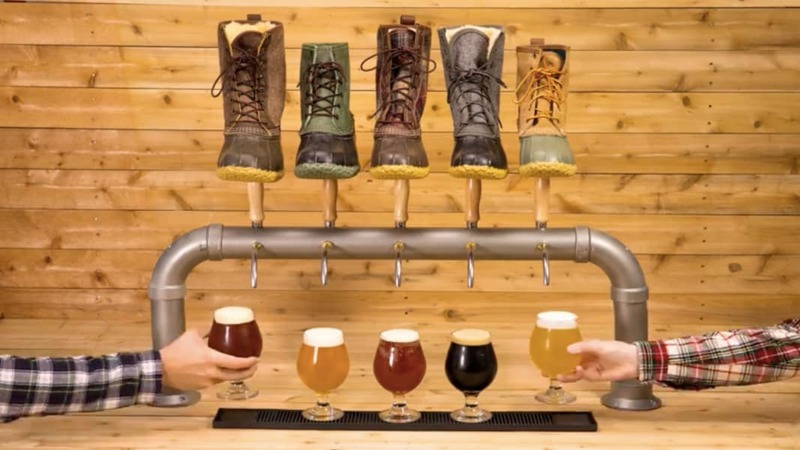 “Five amazing brewers […] will be unveiling outdoor-inspired small batch beers, to complement our new fall collection of Small Batch Bean Boots,” L.L.Bean continued in their caption. While we don’t know specifically what kinds of craft beers will be released, it appears in the promo video posted on Instagram that two of the brews are pale, two are amber and one looks to be a dark stout. Starting on Friday, the beers will be available at the breweries for a limited time. While this may seem like a surprising collab, it’s not really, if only because craft beer is all the rage in Maine. So much so, in fact, there are now more than four-dozen craft breweries in the state. Plus, the press release states that Maine is home to more breweries per capita than any other state. For those who aren’t avid L.L.Bean followers, each season, the brand launches a limited number of Small Batch Boots that combine their signature style with a fresh design; this new collaboration with a select group of Maine breweries is nothing short of inspired. The Small Batch Bean Boots will be available at L.L.Bean retail stores and at llbean.com.